While the memoirs of many scientists are probably best kept for family consumption, there are some breakthroughs where the story is sufficiently engaging that it can be fascinating to get an inside view on what really happened. 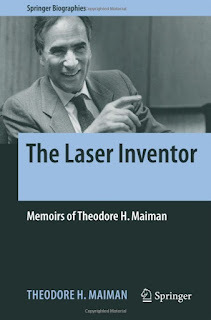 Although Theodore Maiman's autobiographical book is not a slick, journalist-polished account, it is very effective at highlighting two significant narratives - how Maiman was able to construct the first ever laser, despite having far fewer resources than many of his competitors, and how 'establishment' academic physicists, particularly in the US, tried to minimise his achievement. On the straight autobiographical side, we get some early background and discover how Maiman combined degrees in electrical engineering and physics to have an unusually strong mix of the practical and the theoretical. Rather than go into academia after his doctorate, he went into industry - which seems to have been responsible for the backlash against his invention, which we'll come back to in a moment. In describing his route to creating the laser, Maiman doesn't cover up his own worries that he was using the wrong technology, but explains why he felt it was worth carrying on. What comes through is that, unlike many of his contemporaries, he combined a strong awareness of what was sensibly achievable - so avoided extremely corrosive high-temperature alkali metal gasses such as sodium and potassium, used in other labs at the time in an attempt to create a laser. Similarly, he kept away from cryogenically cooled solutions, which might have worked in a lab, but were totally impractical for most real-world applications. And rather than accept that, as many others argued, it would be impossible to used a ruby as the lasing material, he went ahead and proved them all wrong. When we hear his reaction to the 'establishment', Maiman can come across as bitter - but it was with good reason. He points out that 10 people were awarded Nobel Prizes linked to lasers... but the Nobel committee totally ignored the man who built the first laser - a bizarre decision. Almost as soon as Maiman's employer, the Hughes Corporation, announced the successful development of the laser, competitors who more part of the academic establishment, apparently sneering at Maiman's work in industry, tried to minimise his achievement and to suggest that others really 'invented' the laser, even though these designs were never made to to work. This counter-spin went on for decades. Although it's a sad story in some ways, the whole sordid business very much adds to the intriguing nature of the book. I've only one minor criticism, which is that Maiman, probably feeling defensive after this ridiculous carping from his competitors, does seem to slightly play down the contribution of his assistant. In describing how he came to use a camera flash type lamp, Maiman says 'I remembered reading an article about photographic strobe lamps, a camera's flash mechanism... I now had my "aha"!' But in Jeff Hecht's book on the development of the laser - which Maiman appears to endorse - we are told that Maiman's assistant Charlie Asawa looked into pulsed light sources and got the idea of using a photographic flash lamp from an office colleague, Leo Levitt, which he showed to Maiman. This doesn't in any way reduce Maiman's role as the inventor of the laser, it just misses out a little on an interesting part of the process. The Laser Inventor is an interesting and engaging peek into one of modern history of science and technology's most dramatic, far-reaching developments. It's even quite reasonably priced for a Springer hardback. Recommended.